Patriarch Aleksy II of Moscow and All Russia, who is on his first official visit to France since becoming the Head of the Russian Orthodox Church, has addressed the Parliamentary Assembly of the Council of Europe in Strasbourg. He put a special emphasis on moral standards as the main instrument for maintaining peace and assuring future development. Thank you for the opportunity to speak to this high assembly as I have been invited by the President of the Parliamentary Assembly of the Council of Europe René van der Linden on behalf of you all. I am glad to communicate our vision of the past, present and future of our common home, the European Continent, to the members of parliaments of the Council of Europe constituent countries. Recently, the Council of Europe has made some new, unprecedented steps towards bridging with religious communities. In our sight it is the long-awaited response to many calls of religious leaders. Understanding of human person could become an important theme for such a dialogue since it is around anthropology that many problems and sometimes even conflicts arise between faith traditions and secular humanism. The European Continent has been influenced by many cultures that are present here until now. Yet it was within Christian system that the vision of human person's high dignity and of the conditions necessary for its realization were shaped. The Christian faith taught all nations that human beings are created in the image and likeness of God. Christianity has always stressed that if human being lives a moral live he or she may become God's friend (cf. John 15.15) and achieve freedom (cf. John 8.32). Every honest specialist in European history may witness that the Christian attitude to human person destroyed and condemned slavery, formed means of fair judgment, created high social and political standards of life, shaped ethical relations between persons, and developed science and culture. The very conception of human rights, Europe's main political idea, has developed not without some influence of Christian teaching of dignity, freedom, and moral character of human being. From the very beginning human rights developed in the context of Christian morality forming with it a kind of tandem. Yet today there occurs a break between human rights and morality, and this break threatens the European civilization. We can see it in a new generation of rights that contradict morality, and in how human rights are used to justify immoral behavior. In this connection, I may note that morality, with which any human right advocacy has to count, is mentioned in the European Convention for the Protection of Human Rights and Fundamental Freedoms. I am convinced that the makers of the European Convention on Human Rights included therein morality not as something ambiguous but rather as an integral element of the whole human rights system. If we ignore moral norms, we ultimately ignore freedom too. Morality is freedom in action. It is a freedom brought into reality as a result of responsible choice, in which human person restricts his or her self for the good of that very person and broader society. Moral principles secure societal vitality and growth, as well as unity of society, which is one of primary objectives of the European Convention on Human Rights. And whenever moral norms are trespassed and declared to be relative, it may undermine the whole worldview of the Europeans. They may draw nigh to a disastrous moment when European nations risk losing their spiritual and cultural identity and ultimately their own place in history. However I believe that no state power may interfere into human being's personal life. After all, being moral or immoral is a matter of free personal choice. But in public sphere, both state and society should encourage and support moral principles acceptable for the majority of citizens. Therefore they should use mass media, social institutions, and education system to pursue the moral ideals that are linked with spiritual and cultural tradition of the European nations. I believe that it is very important to preserve the moral dimension that inspires and ennobles the European people's lives in order to safeguard the European cultural identity, especially in the context of its contacts with other cultural and civilizational standards. At least, no state power should be used to propagate or encourage things that may weaken or destroy the society's moral pillars. Many societal problems have no solution unless human person, state power, and nation as a whole are subject to moral evaluation. For example, in Russia and many other European countries - both Eastern and Western - the gap between the rich and the poor is growing while any idea of social justice is blurring. In Russia, our church has many times called to discuss the miserable condition of millions of honest workers whose very few compatriots are extremely rich and glaringly extravagant. We are glad to see this initiative supported by many societal and political forces today. We can see that preconditions for proper economical and political decisions are already there. However, even the most efficient legal and social system is unable to completely restrict some people's lust to gain wealth at expense of many others. Charity never arises whenever people do not feel responsible for their fellow citizens. Charity is a result of upbringing in the spirit of traditional moral principles, including Christian ones. Traditional moral principles are also a basis for integration within a multicultural society, which today's Europe actually is. It was well demonstrated, for example, by the World Religious Summit held in Moscow in June last year. The forum participants were Christian, Muslim, Jewish, Buddhist, Shinto, and Hindu. They came from forty-nine countries to express their common concern for the humanity's moral degradation. It was upon this basis of traditional morality and respect for each other's social models and lifestyle that various religious traditions coexisted in Russia, where no wars of religion were ever known. Now too, our church keeps strengthening peace between the faiths through developing an efficient dialogue and cooperation with other traditional religious communities in Russian and other CIS countries. As we all know, Europe and the whole world are today threatened with the extremists and terrorists many of whom wear religious disguises. These destructive forces grow on the soil of religious ignorance and moral scarcity. Therefore I strongly believe that younger generations should have access, if they will, to in-depth study their religious tradition in school. They also need basic knowledge of other faiths since it lays foundation for living together peacefully. Technological progress calls us to look at human rights anew. The believers have their say in the issues of bioethics, electronic IDs, and other technologies that concern Christians. Human being should remain what he or she is without becoming a commodity or a fully controlled element in an electronic network or a subject for laboratory experiments or a cyborg. That is why science and technology cannot be estranged from the moral evaluation of their goals and fruits. The Russian Orthodox Church if fully aware that there are a range of religious world outlooks in Europe and world-widely. We are open for dialogue with them as well as with those who adhere to secularism. Yet we are convinced that no worldview, including secular one, must not claim monopoly in Europe or elsewhere. Therefore we think that casting religion out from public sphere is unacceptable. It is time to acknowledge that religious motivation has its right to exist everywhere including public sphere. In order to avoid clashes between different worldviews we need a serious dialogue between the cultures, in which representatives of both traditional religions and the secular tradition should be most actively involved. I believe that the Council of Europe, which has potential and experience as a place of dialogue about European values, may become a good forum for such a dialogue. The Patriarch thanked the parliamentarians for the opportunity to communicate the Russian Orthodox Church�s �vision of the past, present and future of the European Continent�. He linked the conflicts that arise today with different views �of what a human being is� and with �the gap between religious traditions and secular humanism�. �This is something that can be seen in the emergence of a new generation of rights that contradict morality, and philosophies that use human rights to justify immoral behaviour. In this connection I would like to remind you that the European Convention for the Protection of Human Rights and Fundamental Freedoms includes a reference to morality that has to be taken into account by anyone involved in human rights advocacy,� said Aleksy II. The patriarch also noted the importance of inter-religious dialogue, which is essential in reaching and maintaining peace. �Europe and the whole world are threatened by extremists and terrorists. These destructive forces grow on the soil of religious ignorance and lack of morality,� he said. He also spoke on the problem of the status of Serbia's breakaway republic of Kosovo. �We believe that the way to resolve the issue around Kosovo involves establishing favorable conditions for dialogue. And we need this, involving the mediation of the international community. But that mediation has to unbiased and constructive. That is the approach that will enhance the authority of international mediation, because any kind of unilateral resolution, that doesn�t take into account the opinions of the Serbian people will only result in injustice and suffering of people that will last for many years,� Alexey II said. �A human being should remain a human being, not a commodity, not a controlled element within an electronic network, not a subject for laboratory experimentation, not a semi-artificial entity. That�s why science and technology cannot be estranged from moral evaluation�. 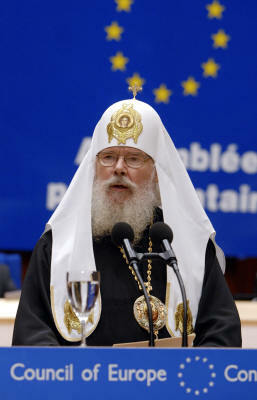 Patriarch Alexy II of Moscow and All Russia, speaking at the Council of Europe on Tuesday, reiterated the position of his Church that gay and lesbian parades amount to "propaganda and advertisement of sin." "When persistent attempts were made to hold a homosexual parade in Moscow, we believed that that meant propaganda and advertisement of sin," Alexy told a session of the Parliamentary Assembly of the Council of Europe (PACE) in Strasbourg, France. Attempts are made to justify homosexuality by calling it a disease, the patriarch said. Yet kleptomania can also be considered a disease, he argued. "Why then no one advertises kleptomania while homosexuality gets advertised via gay parades?" he said. "It is advertisement that is being forced on people who are a very long way from it," Alexy said. The patriarch also said the Church commiserated with all sinners, including homosexuals, "sinners whom we love while we hate their sin." "But at the same time, we Orthodox Christians cannot depart from what is taught by the Bible and by the apostolic tradition of the Church," Alexy said. "Somebody may think otherwise, and nobody must be discredited on the basis of the character of their private lives," he said. "In the same way, nobody must try to force me or my brothers and sisters in faith to be silent and [to prevent us from] using the word sin for something that is called sin in God's Word," the patriarch said. It is the right of religious believers to question the acceptability of legal and political support for a feature of society, he said. Summing up, the Patriarch reiterated the readiness of the Russian Orthodox Church for dialogue, adding that the Council of Europe could be a powerful forum for discussing the most sensitive issues.